Near twenty pairs of feet circle the labyrinth at Trinity Square Park in Toronto. Each pair belongs to a member of the city’s Taproot Faith Community. Founded in 1995, the group is primarily Christian-oriented and predominantly Catholic, but welcomes members of every faith. Together, they meet bi-weekly on Sundays—a small nod to traditional tenets of Catholicism from a group that, depending on your views of the church, isn’t very traditional at all. Despite a history rooted in good deeds and loving thy neighbour, much of society is more likely to identify today’s Catholic Church as the ultra-conservative ringleader in the fight against gay and reproductive rights (among other things). This assessment has merit—as recently as August, Pope Francis reiterated the importance of protecting human life at conception, shortly after Brazil announced plans to distribute the morning-after pill to women who’d been raped—but groups like Taproot really wish it didn’t. Together the groups form an emerging, far-reaching movement that has eschewed Catholicism’s restrictive directives, and, in their place, adopted a new raison d’être: to refocus religion’s considerable power into the fight for social justice. That long list includes achieving gay rights, reproductive choices, ending racism, and finding gender equality. Today’s Taproot meeting at Trinity is one more step toward the social justice end goal. Every year in July, Taproot meets to “walk the labyrinth” and focus on one, big social issue. This time, a member named Gertrud leads everyone in 10 minutes of Tai Chi to begin the service. Movements flow uninterrupted by the awkward giggles of a group trying something new. In time, each member’s face finds a focused calm as Annie Lennox’s voice sings from speakers. From that calm, minds are instructed to meditate. Often, Taproot focuses on ending homelessness or mainstream media manipulation; for the special meeting, members dedicate their thoughts to the refugee. They’re particularly concerned about a prisoner in Taiwan who is on death row for murder and is, perhaps, innocent. Earlier, Taproot wrote the prisoner a letter; they’re now reading his reply. There’s since been scant positive talk of ordaining women heard at the Vatican. Given its roots in patriarchy, it’s not surprising that the Church would regress. Consider the story of the Virgin Mary, who, as the Blessed Virgin, obeyed The Father without question (as is often expected of all good Catholic women today). “Mary has been stripped of her wisdom and courage,” says Canada’s only woman bishop, Marie Bouclin. “She is seen as saying, ‘Yes, God,’ meekly.” Bouclin seems determined to never be meek, even if it means she’s counted among the so-called bad girls who advocate for equality blind to gender, race, denomination and sexual preference. In fact, several not-so-meek groups—such as the Leadership Conference of Women Religious, the Catholic Network for Women’s Equality, and the Roman Catholic Womenpriests—are fighting to get back on a progressive track. They face considerable opposition, with holy men the world over reiterating the old message. Take Neil MacCarthy, the Archdiocese of Toronto’s director of communications. When asked about the fight to ordain women, he says: “The Church isn’t in a position to ordain women, based on the teachings of Jesus Christ.” Then adds: women are always welcome to volunteer at the Church, perhaps as a pastoral assistant or youth group leader. His stance is both common and indicative of the Church’s general view on women leaders. 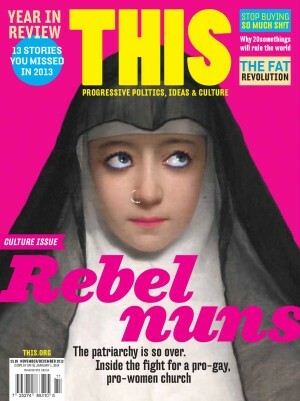 Still, such naysayers haven’t stopped progressive Catholics from trying. In 2002 a bishop, referenced only as Bishop X to maintain his anonymity, ordained women priests. The Danube Seven are what followed: seven German and Austrian women ordained on a cruise ship in the middle of the Danube River. Despite prompting from the Holy See, the women would not say the ceremony, witnessed by 175 people, was invalid. They were excommunicated after refusing to repent. Two years later three women were ordained by the same Bishop, at a secret ceremony, before he retired from his part in the sacrilegious ordinations. In 2008 the Vatican released a decree that stated women who are ordained and bishops who try to ordain them face automatic excommunication. It pointed to the Catholic Church’s Canon Law 1024 (Canon Law is the body of Church laws made by ecclesiastical authority), which reads: “A baptized male alone receives sacred ordination validly.” All ordained women and their supporters are technically “contra legem”: against the rules. Bouclin was not ordained by Bishop X, but rather a trio of women bishops—as was the intent with the original wave of ordinations. It was 2011, and after already having served as a priest for four years, Bouclin rose to the challenge when called upon, both by her peers and, she says, God. Like many women who have been similarly called, Bouclin strives toward a collaborative model of church—a precept that, arguably, is what has the Vatican and its men-in-power so freaked about women-led churches in the first place. Bouclin believes in a collaborative model where intimate communities are formed, and then heard. There is compassion there, she says, not obedience to laws. Her fight is not “against” but “for”—for cooperation and gender equality. Mary Ellen Chown would also rather work within the Catholic Church—albeit a renewed one. Chown is the national coordinator of the Catholic Network for Women’s Equality (CNWE). Chown joined the CNWE in 2000, a result she says of her Catholic upbringing and education, which actually opened her eyes to the need for social justice in the world. In 1981, at 22, Chown travelled to Grenada, where she worked at a school for the deaf through the organization Canadian Crossroads International. There, she saw the weight of family responsibilities placed solely on the women. Yet, they had no power to shape the economic and political decisions affecting their families. She saw the same when she lived in Mexico four years later, where children desperately tried to sell gum, carry groceries, anything for money. Chown thought: The Catholic Church could be a real force for good. “The Catholic Church, as a global institution with great influence,” she says, “has a vital role to play in the world in being a leading example of justice and equality for women in all parts.” Yet, she saw how Catholic culture influenced a sense of male entitlement over women—be it women living in poverty, or those expected to tolerate their husband’s extra marital affairs. Still, Chown is certain the Church can model equality and justice between women and men. It need only start by remembering Jesus’ radical response to women at the time: it was women to whom Jesus first taught the Gospel. If the Church did this, she says, women can be agents of change at all levels of society. In the end it often comes down to this: Sure, Chown could walk out the proverbial church door right now, but who would that help? Certainly not the many who are oppressed in the name of the Church, who would, she feels, with her silence be given implicit permission to operate under the current status quo. The fight may be difficult but she, and her colleagues in the church, believe the shift is coming—change is inevitable and the hierarchy will have to catch up. “The human project is a long one,” says Kilburn-Smith. She compares the Catholic Church to the Berlin wall: it came down fast, but the process getting to that point took time. She’s willing to stick it out.